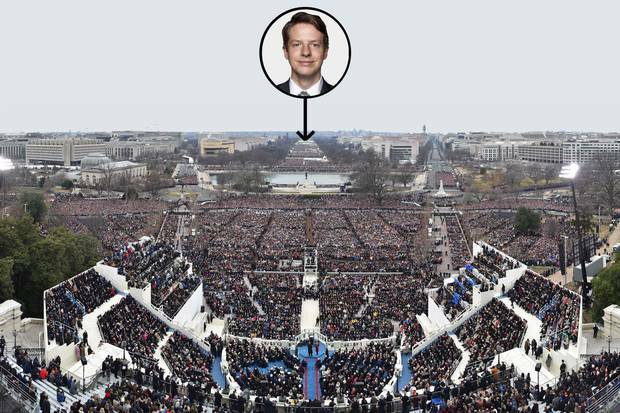 Above: On Jan. 20, 2017, The Globe’s Adrian Morrow watched Donald Trump’s inauguration from the National Mall as the new President decried the ‘American carnage’ of the U.S. economy and promised an ‘America first’ strategy to address it. Under grey skies and drizzling rain, the new President painted a dark picture of the country he was inheriting: It was a place of "American carnage," he said, dotted with "rusted-out factories" and riven by "crime and gangs and drugs." As Donald Trump spoke these words at his swearing-in last Jan. 20, I stood 100 metres away on the National Mall, my first day on the job as The Globe and Mail's Washington correspondent. 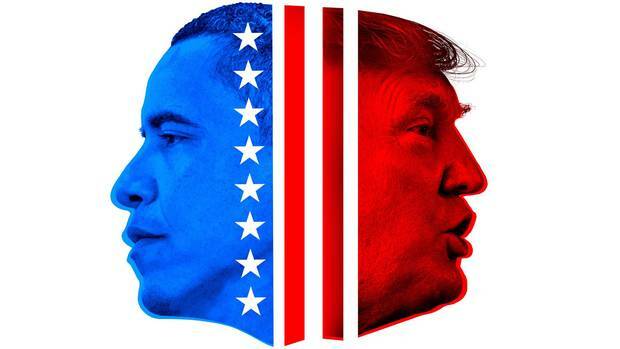 I had been seconded to the foreign desk a few times during the presidential campaign, and had watched as Mr. Trump went from novelty candidate to dominant contender to surprise victor. But none of that quite prepared me for the roller coaster that has been the president's first year in office and mine in his capital. While Mr. Trump has proven to be the same man he was during the election and at his inauguration, his America is a far more complicated place than the caricature a good many of us Canadians have in our mind's eye. 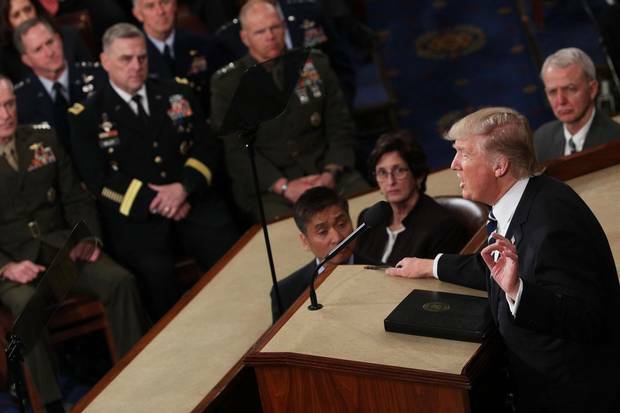 Feb. 28, 2017: Mr. Trump addresses a joint session of Congress in the House chamber of the U.S. Capitol. Some hailed the President’s first address to Congress as a shift in a more statesmanlike direction, but he was soon back to his old ways. It should have been obvious from his inaugural address – and inability to keep his unfiltered thoughts off Twitter – that the weight of office was not going to turn Mr. Trump into anything like a conventional president. Still, the media kept looking for a turn towards normalcy. But every time Mr. Trump would display presidential behaviour, he would inevitably follow with a statement that made it clear he is not ever going to change. A well-reviewed speech to Congress on Feb. 28, which declared "the time for trivial fights is behind us," was followed March 4 by an unproven accusation that former president Barack Obama had wiretapped Mr. Trump's telephone during the election campaign. An Aug. 14 statement denouncing hate groups at a deadly riot in Charlottesville, Virginia, was negated by a declaration the next day that there were some "very fine people" among the rioters. And earlier this month, he followed his call for a bipartisan "bill of love" to help the children of undocumented immigrants with, reportedly, a declaration of disdain for people from "shithole countries" coming to America. June 20, 2017: Lowell Neitzel checks on a plot of sweet corn in Lawrence, Kansas. Mr. Neitzel was one of the Kansas corn farmers Adrian Morrow spoke with for a story about NAFTA’s economic footprint in red states. From a distance, it's easy to imagine all of Mr. Trump's supporters as disaffected former factory workers in red baseball caps loudly cheering for the President to #MAGA – and I've certainly met my share of those. But more frequently, the Trump voters I've encountered have been like Lowell Neitzel and Terry Vinduska, a pair of Kansas farmers I interviewed last spring while working on a story about how NAFTA has helped the country's Republican heartland. The pair weren't crazy about Mr. Trump (not least because he was threatening to tear up the trade deal that makes it easier for them to export their corn to Mexico), but they picked him over Hillary Clinton because of his promise to uphold traditional Republican policies, such as cutting regulations and red tape. "Lesser of two evils," Mr. Neitzel said as we chatted in the office of his family farm. Mr. Vinduska, listening in on speakerphone, chuckled. Electoral math would suggest there are a lot more Trump voters like Mr. Neitzel and Mr. Vinduska than those who fit the stereotype of the aggrieved post-industrial working class. The Rust Belt may have tipped the election to Mr. Trump, but the lion's share of his electoral votes came from reliably red southern and farm states. 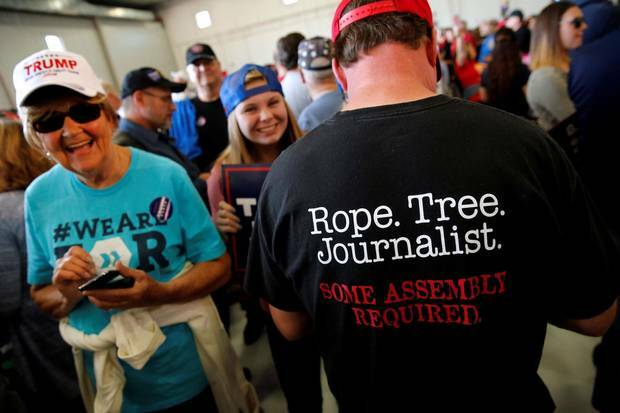 Nov. 6, 2016: After a Trump rally in Minneapolis, photos of this man’s T-shirt – ‘Rope. Tree. Journalist. Some assembly required’ – went viral as the Republican candidate continued his invective against the news media. Covering Mr. Trump's campaign events, I quickly got used to his criticism of the press. But I invariably found his supporters were approachable and happy to be interviewed, even if they'd booed me a few minutes earlier. It's clear his movement couldn't survive without the constant oxygen of media attention. This is true on a macro level (Mr. Trump's presidential campaign first took off because his eye-popping statements drew far more attention than policy pronouncements by more "serious" contenders) and a micro one (for all that they supposedly hate us, his supporters love venting their views to journalists). Mr. Trump, for his part, clearly can't get enough of his own clips, as his real-time Twitter commentary on cable news shows demonstrates. And despite our daily battles to reassert the existence of truth, most reporters will admit there is nothing more thrilling – or that commands our audiences' attention – than covering this President. 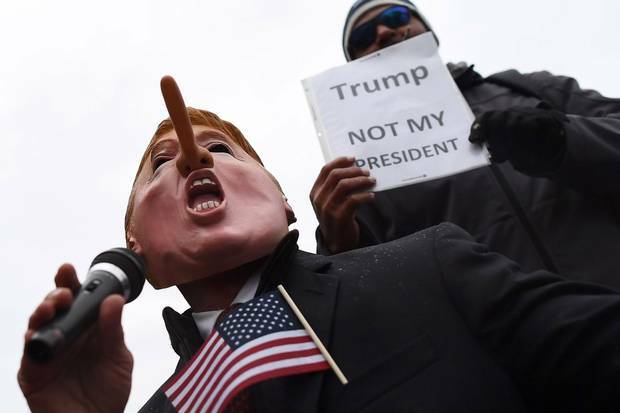 Jan. 20, 2017: Demonstrators in Washington gather to protest against the inauguration. The consequences of this were driven home to me during a week I spent covering December's Alabama Senate election. Republican candidate Roy Moore faced accusations he had molested underage girls, but many of his supporters dismissed them as some sort of conspiracy concocted by the Democratic Party and the Washington Post. "These accusations came in at the last minute," Nadja Lanciotti, a 52-year-old accountant, told me at a Trump rally across the state line in Pensacola, Fla., a few days before the vote. "That's how the Democrats work." 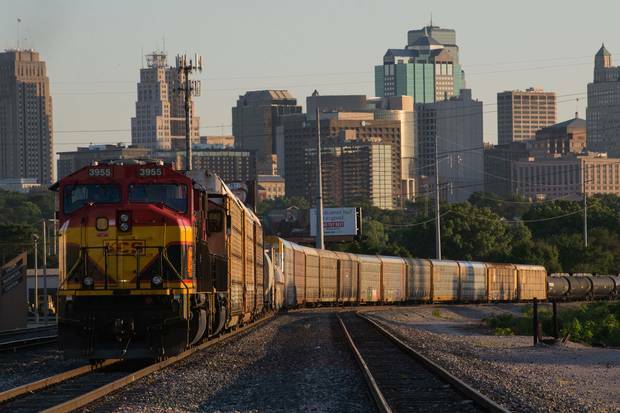 June 21, 2017: A locomotive sits in a rail yard in Kansas City, Mo., one of the cities that most starkly illustrated how the 2016 election pitted cities against their surrounding countryside. The counties including Kansas City mostly voted for Hillary Clinton in 2016, even though their respective states, Kansas and Missouri, mostly voted for Mr. Trump. With a metropolitan area of a little more than two million straddling a pair of Republican-dominated states, you might expect Kansas City to be a conservative metropolis. The same with Birmingham, Ala., the only metro over one million in one of the country's most right-wing places. But walk around either city and you could be in any large metro; the hipster bars and craft breweries and plaid-wearing millennials on bicycles could have been lifted from South Street in Philadelphia or Seattle's U District or the North End of Halifax. And the voting patterns reflect this: The county that includes the Missouri side of Kansas City voted 55 per cent for Ms. Clinton in 2016; the county on the Kansas side went for her 61 per cent. Their respective states, meanwhile, both backed Mr. Trump by 56 per cent. In Alabama's Senate race, Doug Jones barely eked out a statewide victory over Mr. Moore, but carried the county that includes Birmingham by 68 per cent. 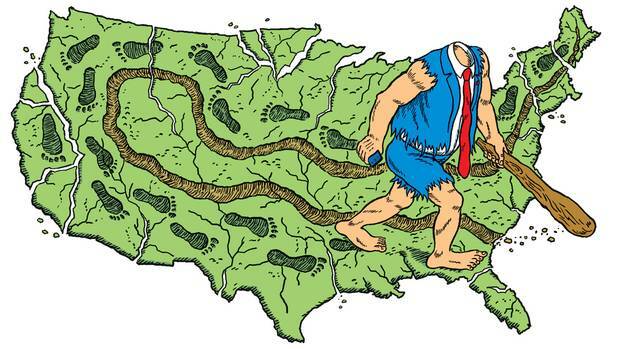 The U.S. electoral system encourages a divvying up of the country into red and blue states, a convenient short-hand for the hyper-partisan split that defines American politics. But the much starker divide – as it is in Canada – is between city and countryside, with suburbs somewhere in between. 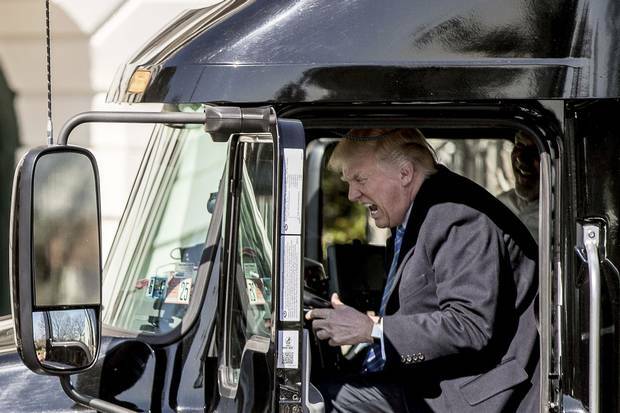 March 23, 2017: Mr. Trump pretends to drive as he gets in an 18-wheeler on the South Lawn of the White House as he meets with truckers and CEOs regarding health care. When I asked Lucas Henein why he voted for Mr. Trump, the Kansas farmer first gave a pragmatic reason: He preferred the Republican position on cutting government regulations. But there was something else, too. "I want to be a family man, be white, I'm Christian, I'm a man. Oh, and I'm straight. That's like the last safe group to discriminate against, okay? And I say that sort of tongue-in-cheek," he told me as we sat in an outbuilding on his property on a sunny spring afternoon. If it seems inexplicable that someone in the most powerful demographic in the world would feel some sort of vague discomfort, try extrapolating that to an entire country. Stoking these anxieties was a key part of Mr. Trump's campaign and he hasn't let up in office. In the President's view, basically everyone is either threatening or cheating the United States. Growing up in the country next door, acutely aware of the wealth and influence of the world's only superpower, it is nothing short of baffling to me that enough white Americans feel such doubt about their nation's place in the world – or their own place in their nation – that this sort of message resonates with so many of them. Nov. 13, 2017: Mr. Trump, middle, joins hands with world leaders for a group photo at the opening ceremony of the ASEAN summit in Manila. There may be a lot of drama in the Oval Office – and a West Wing more Mark Burnett than Aaron Sorkin – but most of the Trump administration's conflagrations have been contained to the palace. Despite the President's semi-regular threats of the possibility of nuclear war with North Korea, virtually everyone else in the world, from South Korea to Rex Tillerson, has kept working on diplomatic efforts. Mr. Trump's attempts to ban members of certain Muslim countries from entering the United States have been repeatedly thwarted or narrowed by the courts. And his move to shut down an investigation into Russian meddling in the presidential election by firing then-FBI director James Comey was swiftly followed by the Justice Department appointing Robert Mueller as special counsel to continue the probe. Most of the things that Mr. Trump's critics would point to as successfully-implemented bad policy – ignoring climate change, giving tax cuts to billionaires – are the sorts of things any Republican president probably would have done. 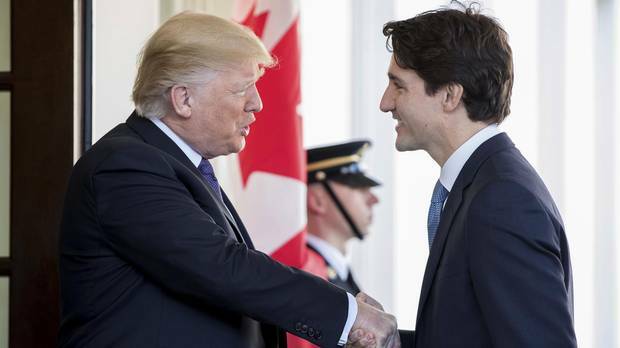 Canada in the year of Trump: A guide to what happened The Trump presidency exposed deep divisions on issues from protectionism and the economy to pluralism and immigration. Here are some highlights from The Globe’s coverage of an eventful year. David Frum: How Donald Trump turned the United States into a headless giant By design and by mistake, Donald Trump is sabotaging the institutions and agencies that protect the United States and sustain the peace of the world.